‘Worse than the biggest bomb blast’—that’s the assessment of a 27 year old Pakistani Hazara student to the Rudd Government’s latest policy announcement that all asylum seekers arriving in Australia by boat will be removed to PNG, and that none of these people will be settled in Australia. Let’s be honest: the popularity of this new policy comes from widespread fear of refugees rather than care for them. In popular media refugees are likened to a natural disaster: we are being ‘overwhelmed’ by refugees, who ‘swarm’, and ‘swamp’ and ‘overtake’ and will eventually drown us both economically and socially. We forget that we rank 52nd on refugee intake (relative to GDP) and that both Kenya and Pakistan have hosted over two million refugees—countries far poorer than ours. In abandoning vulnerable people like that young student to their fate Rudd’s new policy suggests, effectively, that we can only love our own. We are witnessing today an erosion of humanitarian authority for ethical action. In the past humanitarian instruments such as the Refugee Convention have offered common ground for the protection of refugees (and these are still invaluable). But we are presently sinking in the mire of national interest and the mud slinging of petty politics. This current malaise raises a critical question for western culture: what ethical resources are available within society for establishing firm ground from which to act and advocate? As we search for such ethical resources, try this on for size: the book of Deuteronomy, from the Hebrew Scriptures, is considered authoritative by many Australians. A 2009 Nielson poll found that around half the population still considers itself to be Christian, so Deuteronomy’s relentless call to welcome the vulnerable stranger ought to have some resonance. If its message is heard and understood by those who believe it has something vital to say to us today, the result should be a significant portion of the population advocating for a radical welcome for asylum seekers. The thrust of one particular passage in this book (Deuteronomy 10:15, 18-19) turns on a Hebrew word ‘ahav’ that is translated as ‘love’. This is a technical term for deep covenant commitment that is expressed in action. It is one of the special words reserved to express God’s faithfulness to his people: God loves/‘ahav’ his people. But here’s the kicker: ‘ahav’ is also used to describe God’s love for the ‘stranger’ (a word which can also be translated ‘refugee’). This is remarkable: this special word used to describe God’s commitment to his people is also used to describe his dedication to the stranger (10:18). This can only mean that God is on the stranger’s side and will act for their sake. What’s the implication? God’s people must love the stranger too (10:19). Here God is expecting nothing less than a covenant commitment to the stranger. The idea of covenant entails being in relationship with the stranger and being committed to their thriving. The passage indicates that ‘love’ also includes acting justly and providing food and clothing for the stranger. Practically speaking, ‘loving the stranger’ entailed a rich sharing of life between an ancient Israelite extended family and the vulnerable stranger. Strangers lived on the ‘family farm’, sharing in the agricultural, relational, economic, and even religious life of the extended family. This indeed was a ‘radical welcome’. Yet how do Old Testament ethics apply beyond their context? They provide a picture of what it means to be fully human. The Bible makes the radical claim that deep welcome and generosity were always God’s intention for humanity. To live generously leads to the flourishing of life. The contrast between this vision of radical welcome and the Australian Government’s new policy couldn’t be starker. 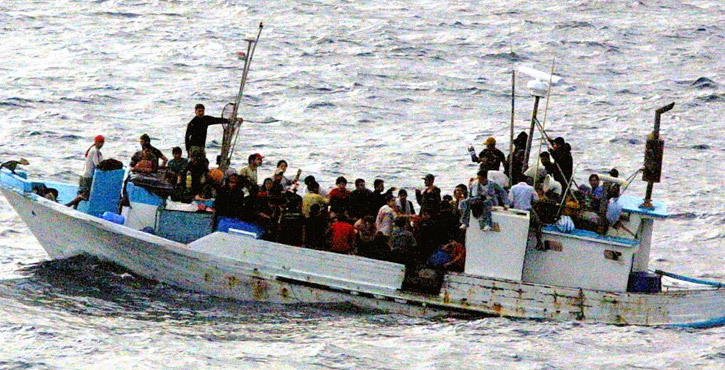 Deuteronomy insists upon rich relationship, whereas Rudd’s new policy banishes all asylum seekers arriving by boat to PNG. Deuteronomy insists upon protection for vulnerable people, whereas PNG has a reputation for human rights abuses and will almost certainly be a place of misery and even death for many. Deuteronomy has a vision for generosity, whereas this policy displays parochialism and selfishness. By this standard, Rudd’s new policy is condemned as immoral. Australian Christians, Muslims, and Jews who read the Old Testament as scripture cannot overlook its insistence on compassion and welcome. For others it may become a critical part in a matrix of ethical resources that together form a platform for just and compassionate politics. The biblical vision empowers those inspired by it to advocate and act not only with direction, but also with hope—despite the pain of this latest policy. For, according to this way of thinking, none less than God is on the side of vulnerable people in search of protection and a home. Mark Glanville is an Australian pastor at Willoughby Christian Reformed Church, Vancouver. He is undertaking doctoral studies in Old Testament ethics at Trinity College, Bristol, U.K., focusing on the 'ger' (refugee) in Deuteronomy. He also writes for the Centre for Public Christianity.